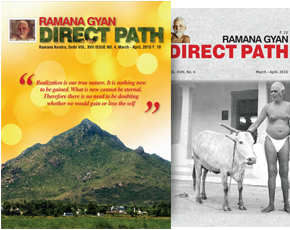 The quintessence of Ramana Maharshi’s teaching is found in a small booklet called ‘Who am I?’ This little booklet contains the first set of instructions given by Ramana Maharshi. They are direct from his unique experience of self-realization. The original set of questions was asked by Sivaprakasam Pillai which was later presented by Ramana Maharshi in prose form. The power of the teaching can be realized by anyone who puts it into practice. 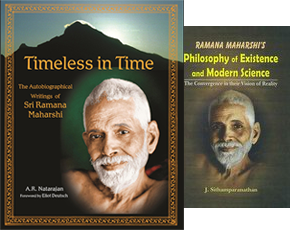 In Talks with Sri Ramana Maharshi 80 we read “Let him find out to whom are the thoughts. Where from do they arise? They must spring up from the conscious Self. Apprehending it even vaguely helps the extinction of the ego. Thereafter the realisation of the one Infinite Existence becomes possible. In that state there are no individuals other than the Eternal Existence. Hence there is no thought of death or suffering.” The full teaching may be downloaded here “Who Am I?”. Here is an adapted version for easy reference. Every living being longs to be happy, untainted by sorrow; and everyone has the greatest love for himself, which is solely due to the fact that happiness is his real nature. Hence, in order to realise that inherent and untainted happiness, which indeed he daily experiences when the mind is subdued in deep sleep, it is essential that he should know himself. For obtaining such knowledge the enquiry, ‘Who am I?’ in quest of the Self is the best means. ‘Who Am I?’ I am pure Awareness. This Awareness is by its very nature Being-Consciousness-Bliss (Sat-Chit-Ananda). If the mind, which is the instrument of knowledge and is the basis of all activity, subsides, the perception of the world as an objective reality ceases. Unless the illusory perception of the serpent in the rope ceases, the rope on which the illusion is formed is not perceived as such. (This analogy is based on a traditional story of a man who sees a rope at twilight and mistaking it for a serpent is afraid without cause.) Similarly, unless the illusory nature of the perception of the world as an objective reality ceases, the vision of the true nature of the Self, on which the illusion is formed, is not obtained. The mind is a wondrous power residing in the Self. It causes all thoughts to arise. Apart from thoughts, there is no such thing as mind. Therefore, thought is the nature of mind. Apart from thoughts, there is no independent entity called the world. In deep sleep there are no thoughts, and there is no world. In the states of waking and dream, there are thoughts, and there is a world also. Just as the spider emits the thread (of the web) out of itself and again withdraws it into itself, likewise the mind projects the world out of itself and again resolves it into itself. When the mind leaves the Self, the world appears. Therefore, when the world appears, the Self does not appear; and when the Self appears (shines) the world does not appear. When one persistently inquires into the nature of the mind, the mind will subside leaving the Self (as residue). The mind always exists only by depending on something gross (physical body); it cannot exist independently. It is the mind that is called the subtle body or the soul. That which rises as ‘I’ in the body is the mind. If one inquires as to where in the body the thought ‘I’ rises first, one would discover that it rises in the Heart. That is the place of the mind’s origin. Even if one thinks constantly ‘I’, ‘I’, one will be led to that place. Of all the thoughts that arise in the mind, the ‘I’ thought is the first. It is only after the rise of the “I-thought” that other thoughts occur. With repeated practice in this manner, the mind will develop the power to stay in its source. When the mind that is subtle goes out through the brain and the sense organs, the gross names and forms appear; when it stays in the heart, the names and forms disappear. Not letting the mind go out, but retaining it in the Heart is what is called “inwardness”. Letting the mind go out of the Heart is known as “externalisation”. Thus, when the mind stays in the Heart, the ‘I’ which is the source of all thoughts will go, and the Self which ever exists will shine. Other than inquiry, there are no adequate means to make the mind permanently subside. If the mind is controlled through other means, it will appear to be controlled, but will rise again. Through regulation of breath, the mind will become calm; but it will remain calm only as long as the breath remains controlled. When the breath is no longer regulated, the mind will become active and start wandering. Like the practice of breath-control, meditation on the forms of God, repetition of mantras, and restriction on diet, are temporary aids for stilling the mind. Through practice of meditation on the forms of God and through repetition of mantras, the mind attains one-pointedness. For such a focused mind self-inquiry will become easy. By observing diet-restriction, the quality of mind improves, which helps self-inquiry. However sinful a person may be, if he would zealously carry on meditation on the Self, how would most assuredly get reformed. The mind should not be allowed to wander towards worldly objects and what concerns other people. However bad other people may be, one should bear no hatred for them. All that one gives to others one gives to one’s self. If this truth is understood who will not give to others? When one’s self arises all arises; when one’s self becomes calm all becomes calm. If the mind becomes still, one may live anywhere. What exists in truth is the Self alone. The world, the individual soul, and God are appearances in it like silver in mother-of-pearl. These three appear at the same time, and disappear at the same time. The Self is that where there is absolutely no “I” thought. That is called “Silence”. The Self itself is the world; the Self itself is “I”; the Self itself is God; all is Siva, the Self. He who gives himself up to the Self that is God is the most excellent devotee. Giving one self up to God, means constantly remembering the Self. Whatever burdens are thrown on God, He bears them all. Since the supreme power of God makes all things move, why should we, without submitting ourselves to it, constantly worry ourselves with thoughts as to what should be done and how, and what should not be done and how not? We know that the train carries all loads, so after getting on it why should we carry our small luggage on our head to our discomfort, instead of putting it down in the train and feeling at ease?